In nearly all the early photographs of St. Boniface, across the river from Winnipeg, stood the "turrets-twain" Cathedral made famous by the American poet John Greenleaf Whittier in his poem "The Red River Voyageur." In all of these photographs could be seen a long, gabled, white building which was the home of the Order of Grey Nuns. The Cathedral was lost in a fire in 1860 and the Cathedral which followed was succeeded by the present magnificent Basilica in 1908. The white building which is still standing has been in the news lately. The Grey Nuns now live in a new brick building right beside their first home and they are wondering what is to become of the building which served them for so long. Is it to disappear? Will it be moved to LaVerendrye Park and preserved? What ever happens, say the Grey Nuns, it must not be pulled down. Their home, they say, was the oldest continuously occupied house in Greater Winnipeg. It was built at the direction of Bishop Joseph Norbert Provencher and completed in 1847 as a home and a school for the first four Sisters of the Order of Grey Nuns who came from Eastern Canada to the West in 1844. In the reception parlour of the house is an oil painting which shows their arrival at one o'clock in the morning of June 21st of that year. The tall bishop is holding a lantern high to light their way up the river bank. Three of them were able to manage by themselves but the fourth, Sister Lagrave, had to be carried because she had sprained her ankle badly on one of the seventy-eight portages of the two-month-long canoe trip from Montreal. The foundation for the Grey Nuns home came from the Bishop's two-storey stone house. His own home looked strong enough but it was beginning to lean. He agreed it couldn't be repaired, had it pulled down, and the stone used for the foundation of the hundred-foot long log house he was building for the nuns. Sister Guychon, who came to St. Boniface in 1905, says, "I remember the stones. When I joined the Order they were visible. They were cemented over later. At the back there are corners where the cement has come off and you too can glimpse the old stones." Two years after the nuns arrived the log part of the house hadn't been started. In June of that year Bishop Provencher wrote that the logs, which had to be floated down the river, had arrived but were still in the water. When it was finished the Grey Nuns' home was a two-storey building with a roof slanting up to a ridge from four sides. In the slanting part were small hooded windows called dormers because they were in the sleeping rooms. (The French verb "dormer" means "to sleep"). In 1939 the oak treads (the flat part of the stairs) were worn thin from the footsteps of nearly a hundred years. The thrifty nuns, however, didn't order new ones. They merely had the treads turned over. The undersides were still flat and strong and the rises (the upright parts) were still good. "There now," said the nuns when the job was done, "the stairs will be good for another hundred years." The windows of the small chapel in their house were Gothic style (two long curves meeting at a top point). The small panes of glass came in a sailing ship from England to Hudson Bay and from there by York boat to St. Boniface. Today the end of the chapel is brick but two of the windows along the side can still be seen. Among the other treasures which the Grey Nuns have prized are the altar at which Bishop Provencher knelt, seven hand-made chairs, and a cupboard with double doors. Looking towards St. Boniface in the 1850s. From the ferry landing - looking towards St. Boniface, sometime after 1860. In the garden at the front of the house is a statue of Mother Youville who founded the Order of the Grey Nuns in 1738. With her back to the river she watches the old home and, perhaps, prays for its safety. St. Boniface: named after an English missionary who was called the apostle of Germany. 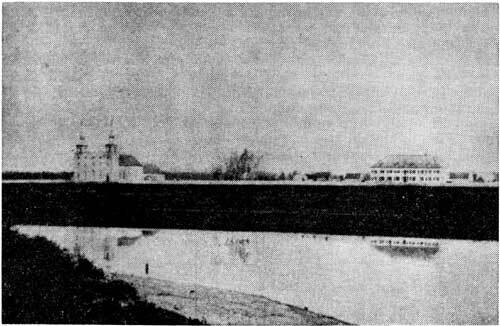 The use of the name of a German apostle arose from the fact that among the de Meuron Regiment, brought to the Red River Settlement by Lord Selkirk in 1817 to help restore order, were German and Swiss soldiers who were given lands along the Seine River in the present city of St. Boniface.